The original IBM PC's Power Supply Unit (PSU) had an aggregate output rating of 63.5 watts. It's now easy to find PC PSUs that can deliver almost nine times as much power. Essentially, though, the latest 550 watt EPS12V PSUs are very similar to the old units. They're cheaper, they're less temperamental, they emit less radio noise and some of them are a lot prettier, but they get the job done in basically the same way. 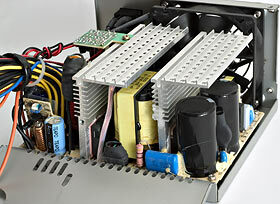 The simplest kind of power supply that takes mains alternating current (AC) and outputs low voltage direct current (DC) is the "linear" type, consisting of a transformer, a rectifier, and some capacitors, plus an optional regulator if you don't want its output voltage to vary much with load. Linear PSUs are big and heavy and inefficient, though; about four-tenths of the power going into one leaves as heat, not as useful output. Run a 300 watt stacked PC from a linear supply and you'll have to get rid of at least 200 watts of heat from the power supply alone. To avoid this, PC PSUs are switched-mode, or "switchmode", designs. Switchmode PSUs manage efficiency of 85% or better. Deliver 300 watts, waste 50 or less. The components in a switchmode PSU that let it do what it does are Metal-Oxide Semiconductor Field-Effect Transistors, or MOSFETs. Transistors are solid state switches that can operate much faster than any mechanical switch; that's why CPUs are made out of transistors, not relays. MOSFETs are high power transistors; they can switch a lot of current. This makes them useful for power conversion. Mains AC gets "rectified" into DC after it enters a PC PSU, then converted back into AC again, at a much higher frequency than its original 50 or 60Hz (depending on your local mains supply). The device that does this is a "chopper" inverter, probably with an output frequency of about 25 kilohertz. The chopper uses MOSFETs to regularly interrupt the input DC, giving an output signal that alternates between zero volts and full input voltage. Later components in the PSU can be given, one way or another, half of the input voltage as their "ground" potential. This makes the output of the chopper work, as far as the rest of the PSU's concerned, just like regular plus-minus-plus-minus alternating current. This expertly bent AOpen PSU's showing off its three primary components - the yellow-wrapped main transformer, the inverter and regulator MOSFETs and their aluminium heat sinks, and the big cylindrical smoothing capacitors. The PSU needs high frequency AC because the next component in the chain is a transformer, and the higher the AC frequency, the smaller the transformer you need to use for a given power level. Even a 500 watt PSU will have a main transformer in it that's only be the size of a child's fist. If that transformer had to work at mains frequency, it'd be a multi-kilogram lump that filled most of an ATX PSU casing all by itself. The transformer also provides isolation - it disconnects the output rails of the PSU from the mains. It's the component chiefly responsible for preventing mains voltage being delivered to your PC if something goes wrong. The transformer has a couple of taps on it - one for a bit more than five volts, and one for a bit more than 12. A few PSUs have a tap for the 3.3 volt rail as well, but most just regulate down some of the 5V rail to make 3.3. The 5V and 12V rails are also regulated, to pull them down close to their specified voltages. This regulation's done by more MOSFETs, here used as "switching regulators". Switching regulators don't actually change the voltage going through them. They just turn it on and off very quickly. Feed a switching regulator 20 volts and ask for 10 volts from it, and it'll rapidly pulse its output so that half the time its output is at 20 volts and half the time it's at zero. Do this fast enough, and put a capacitor or three across the output to smooth it out, and you get a nice clean ten volts without ever having to just throw watts away as heat. Linear regulators, in contrast, work like magically variable resistors; they're simpler and cheaper, but like linear power supplies, they waste a lot of power as heat. Switching regulators and choppers aren't 100% efficient either, which is why power supplies have those chunky aluminium heat sinks inside them. At the bottom of each heat sink is a collection of MOSFETs. The latest PSUs are sprouting more pins on their plugs, but the rails are the same. The different voltage outputs of a PSU are often referred to as "rails". The three main power rails for a modern PSU are +3.3V, +5V and +12V; between them, they'll account for almost all of its power capacity. The next highest rated rail will be the +5VSB (standby) rail, which stays powered up whenever the PSU has mains power; that's what lets your computer power up in response to LAN activity or a space bar press. +5VSB will only account for a few per cent of the total rating, though, and the negative rails (-5V and -12V, which are seldom used for anything in modern PCs) will account for even less. Because practically every PSU creates its 3.3V output by regulating down its 5V rail, 3.3V and 5V typically have a shared rating. 3.3V may have a 26 amp rating by itself, say (85.8 watts; for DC electricity, watts always exactly equals volts times amps), and 5V may have a 28 amp rating (140 watts), but the two together may only be good for 200 watts. You'll only be able to load the 3.3V rail to maximum if you're asking for 22.8 amps, or less, from 5V. Because all of the power rails come, ultimately, from one transformer, there's also an aggregate maximum power for 3.3, 5 and 12V all put together. Continuing the above example, 12V may be good for 30A by itself (360 watts), but all three power rails together may only be rated at 450 watts. In the real world, very high PSU ratings are seldom important. If you're not running giant drive arrays, big Peltier cooling rigs and/or an amazingly overclocked CPU, a quality 350W PSU should be more than enough for any system. Extra capacity doesn't hurt, though; a computer that only needs a 300W PSU won't draw any more power if you give it a 600W one. As power supplies approach their limits - and the spec sticker on the side may be a bit optimistic about the power a given PSU can actually deliver - they generally lose rail voltage. Most PCs are perfectly happy with slightly out-of-spec input voltages - 10%, say - but when the input voltage sags much more than that, the computer can become unreliable. 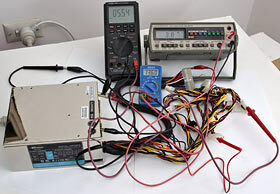 Rail voltages can also change when something goes wrong with a PSU. Sagging voltages can be annoying, but it can be much worse if the voltage goes up. To prevent that, PSUs generally have a "crowbar" circuit that monitors the 5V output and, if it goes higher than about 6.5 volts, shorts the PSU's input to blow its fuse (hence the name - it's like dropping a crowbar across two conductors to deliberately trip a breaker). A PSU that's blown its fuse, and which instantly blows the next fuse you put in it too, may be doing it for a good reason. If you want to see what your PSU's rails are doing, you can check them with the system monitoring utility of your choice (Motherboard Monitor, say) while you run software. This usually gives pretty accurate voltage numbers, and is always useful if all you want to do is see whether the voltage dips much when you do something, but you shouldn't rely on these readings completely. They're at the mercy of the hardware monitoring chip on your motherboard, and may be inaccurate, or even change significantly when you update the BIOS. The voltages displayed in the "PC health" menu in your BIOS setup program come from the same source, and are no more accurate - and you can't run software while checking them. To get really accurate numbers, therefore, you have to hook up a voltmeter - or, preferably, a few of them, or a fancy multi-input multimeter, so you can monitor multiple rails at once. Jumper the ATX connector's single green wire (pin 14) to ground and you can monitor PSU voltages on the testbench - but that tells you nothing about loaded voltage. This PSU's output has been tweaked up as far as it'll go. 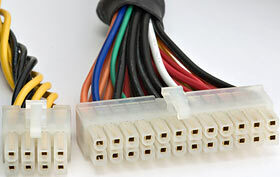 There are several wires coming out of the PSU for each rail, and it doesn't matter which one you monitor. Pick whatever's most convenient. It's easy to keep tabs on +5V (red wires) and +12V (yellow wires) if you've got one spare drive power connector that you can poke your meter probes into. +3.3V (orange wires) is trickier. If your PSU has a six-pin "AUX" plug that you're not using (you probably won't be; AUX connectors are usually only seen on server boards) then a paper clip poked into one of the orange-wire terminals on that plug will give you a monitoring location for 3.3V. Otherwise, you'll have to strip a bit of insulation on one of the main ATX connector's orange wires and hook up there. Note that the above wire colours only count if you've got a standard power supply. If your PC is a proprietary machine - a Dell, in particular - all bets are off regarding wire location and colour. Standard PSUs can be used in such computers, but only if you rearrange the plug wiring. Note, also, that unless you've got a plastic PC case and/or a bunch of show-off lacquered components that don't make electrical contact with each other, the chassis of the computer and the power supply should be earthed. This means your negative multimeter connections can all go to any piece of chassis metalwork; you don't have to cram the negative probes into the drive power connectors too. Here's the power supply chapter from an old edition of Upgrading and Repairing PCs. The modern PC PSU, even the el cheapo highly dodgy variety, is a rather highly evolved animal. PC PSUs have always been switchmode units, but they're now much friendlier than they used to be. A characteristic of the switchmode design, for instance, is that it needs a load on all of its rails at all times. Modern PSUs don't need much load, and they get a bit of 12V rail load from their cooling fan(s), and they have internal resistors that lightly load the rails even when there's nothing plugged in. Older PSUs - well before the days of ATX - would notice if you were trying to run them unloaded, and shut themselves down. Some very old (or very cheap) PSUs would simply burn up if run without a load. This was the case with the original 192 watt IBM AT PSUs, for instance; their 12 volt rail wasn't heavily enough loaded by an AT system without a hard disk, so hard-drive-less ATs came with a chunky, and hot-running, wirewound resistor in one of their drive bays, with a drive power receptacle hooked up to it.